I've heard many miraculous stories of how God has blessed people in sensational ways when they honour Him with a commitment of time and money. These seem far removed from the experience of my husband and me, where I sometimes wonder what the difference is between their faith and ours. 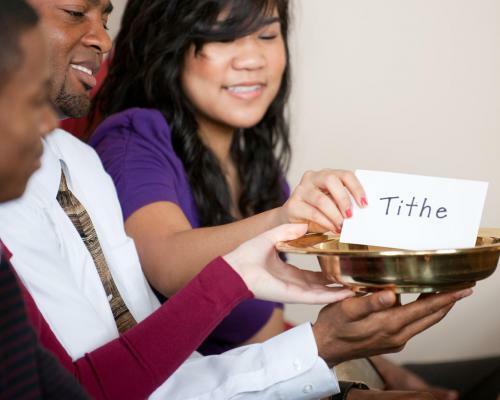 We return tithe and give offerings to church and charities regularly, as well as helping in practical ways. No matter how limited our income is, we realise it is our responsibility and privilege to share our blessings. We've had close calls and providential rescues at times but for the most part, we plod along, struggling to make each project work and to pay all our bills. A year or so ago, I took on a part-time job that gave us a muchneeded boost to our bank balance. We discussed what we would do with the thousands of dollars accumulating. Nothing frivolous but a new fridge was high on the list. Our current fridge was a temperamental, expensive-to-run gas fridge. We were looking at a modern, energy-efficient model that would run on our small solar electric system. We contacted a dealer, perused brochures and even made a tentative commitment to purchase when the dealer told us the model we chose was no longer available. We hesitated, not knowing what to do. Soon after, I was driving into town and running late again. As I drove along the dirt road, an oncoming vehicle made me move across to the cambered edge. The tyres slid on the loose gravel and before I had time to think, I'd lost control. My next view through the windscreen was of greenery scraping past as the car slid on its side up an embankment toward the trees. The following few days were times of disappointment, questioning and frustration. Yes, we were grateful my little daughter and I were unharmed. Yes, we were grateful a friend gave us the loan of a car to tide us through. But the wrecked car was not insured and as we searched on the internet for used cars, we realised the money saved for our fridge would be needed for a replacement vehicle.A blessing? It was hard to talk about God's providence when it felt like "Murphy's Law" at work. Just when we thought we had the resources to make in improvement in our lives, along came a massive bill to take it away. Months later, the recession began. Without investments, it didn't have as great an effect on us as it did on others. But a positive outcome was the boost the Australian government gave to those of us on a low income. Financial incentives and family bonuses were a real blessing to us. Once again, our bank balance grew and we started to make plans to spend our money wisely. Maybe this was the time for a new fridge as gas prices were rising and we needed to be as cost-effective as possible. But it seemed "Murphy's Law" struck again. Within a couple of weeks, our hot water system broke down, the irrigation pump for our vegetable crops broke and the suspension failed on our new car. So much for "getting ahead"! While the hot water system was covered under our house insurance, it was gas-powered and we wanted to upgrade to a solar system to save costs. This would be an extra thousand or more than the insurance payout. Not being on mains power, we also weren't eligible for the government rebates to those wanting to be more "eco-friendly." In the months it took to arrange a new hot water system, we boiled water on the stove and had 10 centimetre-deep baths. It seemed so easy to whinge about how inconvenient our circumstances were. Finally, we got our expenses sorted out and our purchases made. We seemed destined to never get out of the pattern of living weekto-week. But thinking about these experiences, I realised that perhaps my whole perspective was wrong. It was an obvious idea but what if God actually knew beforehand about the car accident and had provided for it? What if God knew about our other bits and pieces falling apart, and had given us a well-timed boost to cover our bills?